NFC marketing is a proximity marketing channel used to interact with a location or a physical object at a small distance. NFC tags/stickers are embedded on OOH displays or products. NFC technology enables a seamless exchange of information with just a tap. Let’s discuss what NFC technology is, how does it work & how can marketers leverage it. 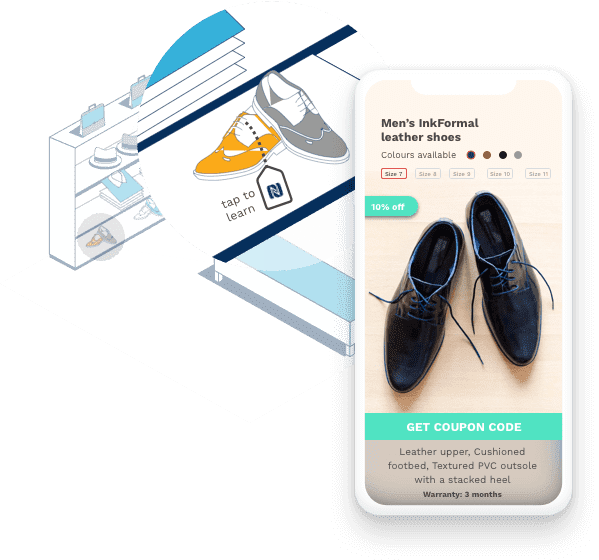 How to set-up an NFC marketing campaign using Beaconstac? 1. Embed NFC tags on products or business location. 2. Create campaign landing pages. No coding required. 3. Consumers tap to access campaigns linked to the NFC tag. NFC hardware is available in multiple form factors. Beaconstac currently provides two basic form factors - NFC tags and stickers. These NFC stickers can be stuck on posters, labels, table tents, store windows and tickets with a compelling copy that encourages consumers to tap on them. Alternatively, businesses can also tie NFC tags to products directly. Most of the NFC use cases are aligned to interaction with the product, however, with new form factors and increasing capabilities, NFC technology is also being used on store windows and posters to attract passers-by. Here are some examples of embedding NFC on products and locations. Next step is to create a landing page that users see when they tap on the NFC tag. This landing page is quick and easy to create with the Beaconstac platform. We call these landing pages - markdown cards. You could also create forms for feedback using the same platform. These campaigns can be created from the scratch with an easy-to-use editor or leverage one of our pre-designed templates. Once you create NFC marketing campaigns, assign them to the NFC hardware from the Beaconstac dashboard. You are set to interact with your consumers. As they tap their NFC-enabled smartphones against your product labels or posters, they can access the campaigns set against them. This is what appears on the smartphone when consumers tap-to-learn. What is NFC (Near Field Communication) technology? NFC stands for Near Field Communication, and this technology allows two devices, or a device and a physical object to communicate without having to set up a prior connection. This device can be a smartphone, tablet PC, digital signage, smart posters and smart signs. NFC technology has been in the payment section for quite some years now, but in recent years, forward-looking marketers and advertising professionals are leveraging NFC for marketing and delivering richer and more interactive customer experiences. Let’s walk through what happens when you put up a NFC-enabled smart poster in your business premises. Once you embed NFC tags on your product or design a smart poster or smart window display, the consumer can tap on it to access campaign information. When the consumer taps on a tag or sticker with an NFC-enabled smartphone, the smartphone detects the URL tied to the NFC. This URL is sent to the cloud server. The server responds with the campaign linked to the URL. This campaign is then displayed on the consumer’s smartphone. NFC marketing is one of the most seamless ways of exchanging information because unlike WiFi marketing it does not require the consumer to configure the smartphone to the source. Use NFC on nearby signages and bus and subway banners to qualify your market segment with the additional step they take to dive deeper into the ad. Allow consumers to access more-in-depth product information, videos, find stores nearby, navigate to the business location and connect to social proof - in just a tap. Rarely do people type in the website URL from the business card. Make it easy for consumers to access your website and save your contact in a single tap. Leverage NFC at checkout kiosks or POS machines to enroll customers to your loyalty program. Let them start earning points right away! One of the major difference in e-commerce and physical shopping is access to reviews and ratings. Allow consumers to read product reviews in a single tap. This not only enhances shopping experience but also might get your product some positive reviews. One of the most obvious yet powerful use-cases of NFC is tap-to-learn. You could give access to the ingredients of a dish, tutorial videos, warranty cards, product description and the list is endless. Allow shoppers to interact with the labels or tags of items they are interested in trying out. Let your store assistants stack up these items in the trial room before the shopper enters. To enhance the experience, you can also allow shoppers to tap-and-request a different color and size. Static exhibits are a thing of the past. Museum enthusiasts are eager to learn about the story behind these artifacts. Allow them to access information such as date, the artist behind the piece, the story, an audio recording and more. NFC technology has been known for payments for the longest time. NFC tags power services like Apple Wallet and Google Wallet. Since NFC tags can be embedded into any physical product, any product can become its own payment terminal. Empowering products to sell themselves enhances the shopping experience and eliminates the need to stand in checkout queues. NFC generates a single-use transaction key that can be used just once. This makes the transaction safe and quick. Beaconstac NFC solution currently does not allow payments. Where can I employ NFC tags for marketing? The possibilities of NFC tag placement are numerous. However, we have picked up the most popular ones to help and inspire you to kickstart your NFC marketing campaigns.